346 pages | 69 B/W Illus. Vladimir Burkov, Doctor of Sc., Professor, Full member of Russian Academy of Natural Sciences. In 1960s Vladimir Burkov was the father of the academic school of control in organizations. Now he is the author of dozens books on control theory, game theory, graph theory, discrete optimization, and management, a vice-president of IPMI-SOVNET, and the manager of many successful consulting projects. V. Burkov is a head of the department at the V.A. Trapeznikov Institute of Control Sciences of Russian Academy of Sciences, the leading academic center of Russian control theory. Mikhail Goubko, Doctor of Sc., Professor of Moscow Institute of Physics and Technology. Mikhail Goubko belongs to the core of the academic school of control in organizations. He studies mathematical methods of complex systems' structure optimization and their applications in different fields. Works at the V.A. Trapeznikov Institute of Control Sciences of Russian Academy of Sciences. Nikolay Korgin, Doctor of Sc., Professor of Moscow Institute of Physics and Technology. Nikolay Korgin belongs to the core of the academic school of control in organizations. His interests include mechanism design and experimental game theory along with their applications in management. He has rich experience in research and teaching the theory of control in organizations. Works at the V.A. Trapeznikov Institute of Control Sciences of Russian Academy of Sciences. Dmitry Novikov, Doctor of Sc., Professor, Head of Control Sciences Department at the Moscow Institute of Physics and Technology, Corresponding member of Russian Academy of Sciences. 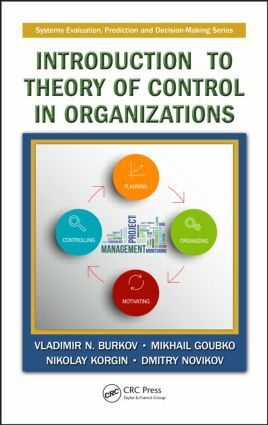 Dmitry Novikov is the leader of the theory of control in organizations. He is the author of dozens of books and hundreds of papers on different aspects of control and management. D. Novikov is a deputy director of the V.A. Trapeznikov Institute of Control Sciences of Russian Academy of Sciences.